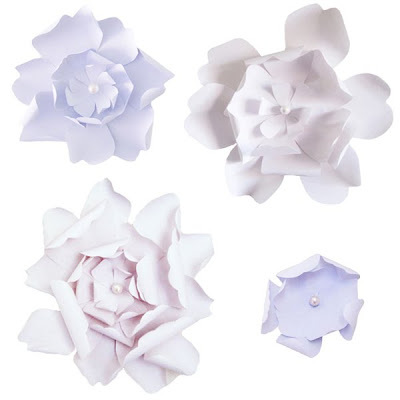 These are just some of the paper flowers I made for the wedding (I also had lots of flowers in light blue). I got the inspiration from the Chanel Couture 2009 show. We used them to decorate the stairways in my house, the wedding table at the reception, the trees in my garden, and so on ... They give a soft and whimsical feel when hung on the wall, so they're pretty amazing as wall-art (right now we have them in our apartment). They are pretty easy to make. All you need is a nice paper, glue-gun, scissors, a pencil (to shape the petals), and pearls. Please email me if you'd like to know the steps to make these flowers.